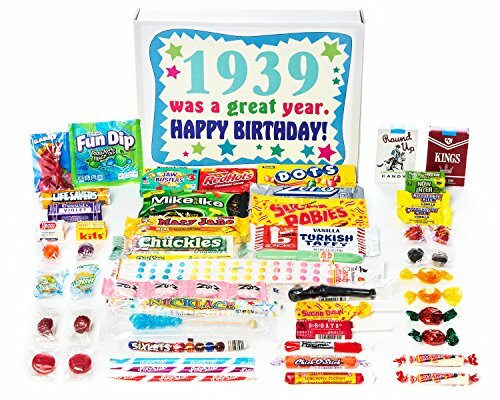 Make your mother’s special day memorable with one of these top 80th birthday gift ideas for Mom. A milestone birthday like this is a time to look back and reminisce. 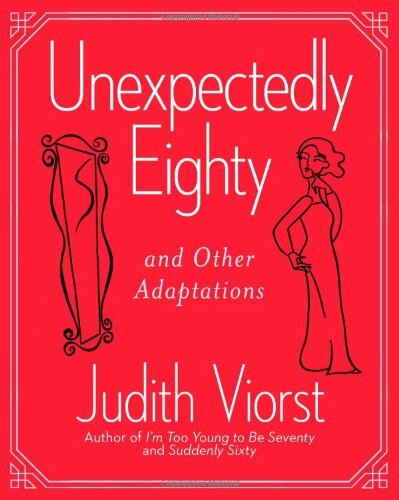 This delightful personalized Ultimate Birthday Book is an incredible memory-jogger that your Mom will enjoy reading over the next few months. 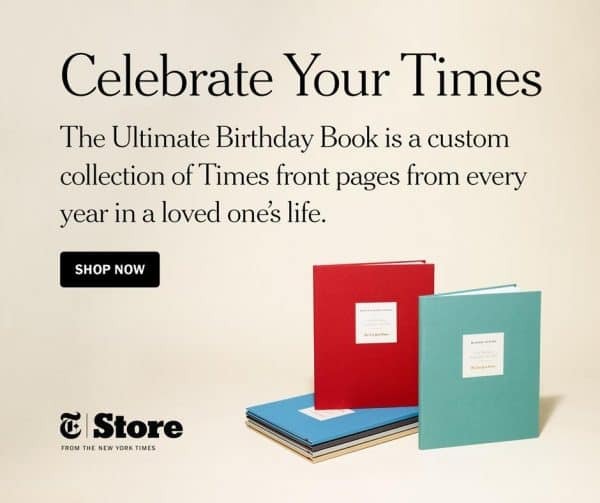 The book features every New York Times front page on her birthday for her entire life – 80 years of memories in one amazing book! 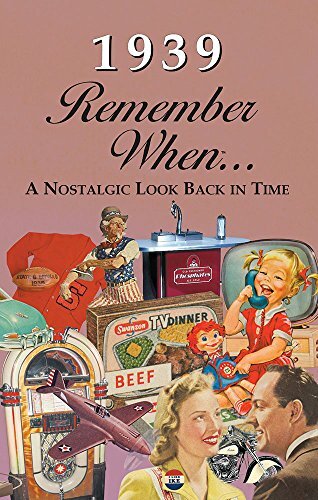 She’ll have a blast recalling historical events – it’ll be interesting for her to find out which events she recalls and which might have been forgotten. When looking back over 80 years, I’m sure that many of your Mom’s favorite memories involve her family. 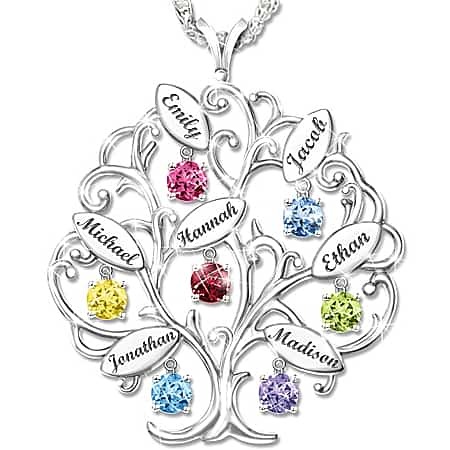 A personalized family tree necklace is a beautiful and stylish way for Mom to display her love for her family! This best-selling family tree necklace features up to 7 loved one’s names, each engraved on a tiny “leaf”. Dangling gracefully from each leaf is the corresponding birthstone. 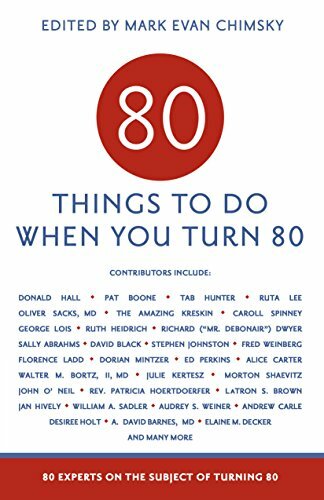 An 80th birthday gift that your Mom will treasure long after her birthday is over! 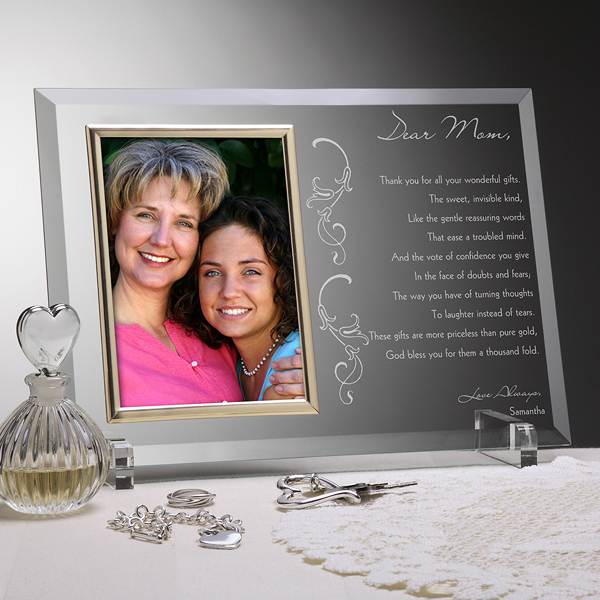 This beautiful glass frame is a thoughtful way to combine a favorite picture with a heart-felt expression of love for you mom! Add any title (Mom, Mama, Ma) to the top, and choose from 6 poems (or write your own) to be custom engraved on the glass frame. Add your name and loving sentiment to the bottom to create a keepsake that your mother will treasure forever. Mom can stay warm and cuddly while wrapping herself up with the ones she loves most in this super-soft blanket. 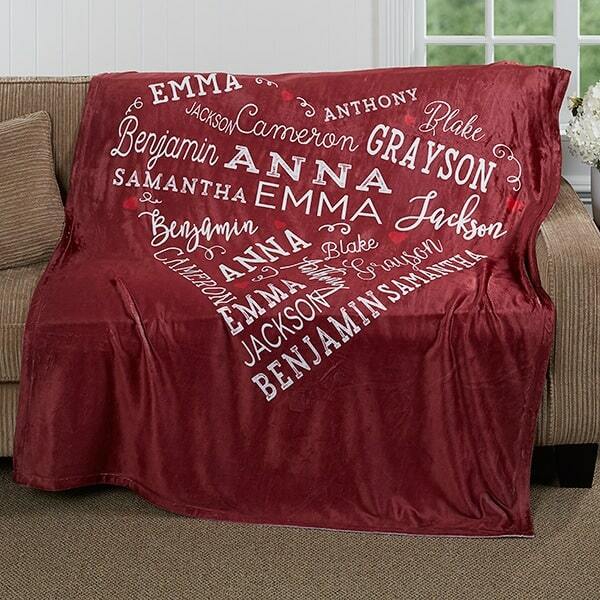 Made out of ultra-comfortable fleece, the throw features a free form heart that is filled with the names of up to 21 of her family members. The perfect size and weight for taking a nap under or to use while reading or watching tv. 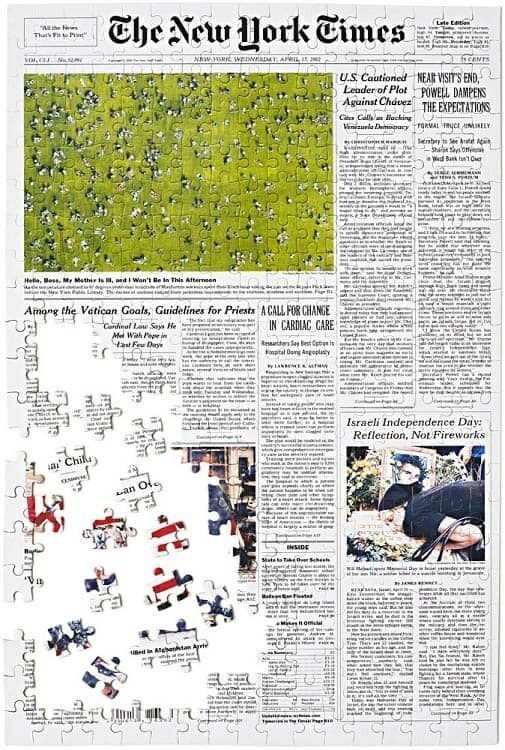 Here’s a fun gift that Mom can enjoy with family and friends –a jigsaw puzzle that is an exact reproduction of the front page of the New York Times from the day she was born! Available in your choice of 3 sizes, it’s a unique and thoughtful gift that will bring your Mom hours of enjoyment! 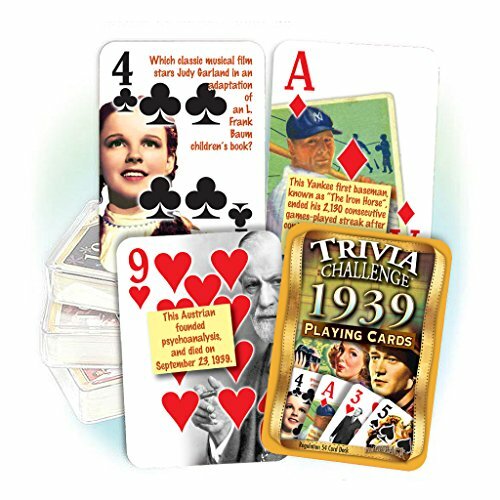 My, how times have changed – and this darling personalized canvas is the perfect way for everyone to find out just how much has changed in 80 years! 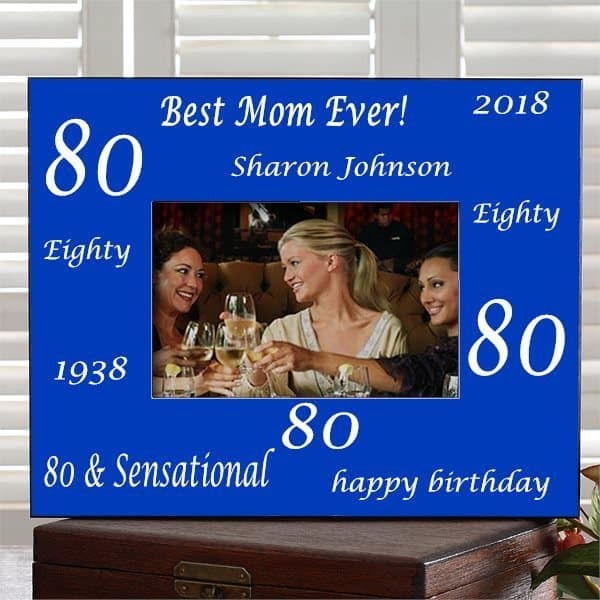 The fun canvas is personalized with Mom’s name and birthdate at the top. Underneath, she’ll find all kinds of trivia about what was going on in the world, including entertainment and sports results, from the day that she was born. There’s also a cost of living comparison of common items between now and then. 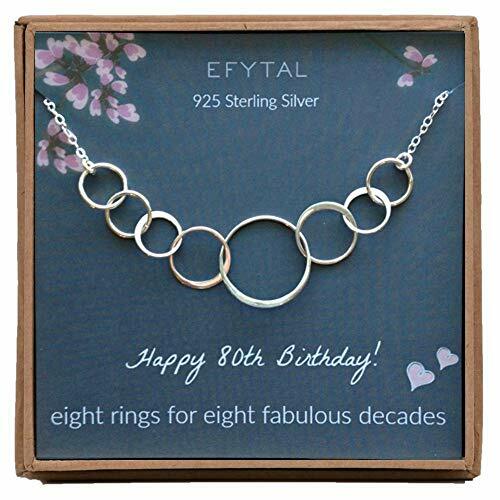 Delight the stylish Mom with an elegant 80th birthday necklace! Striking necklace features 8 intertwined circular charms...8 rings for 8 decades! 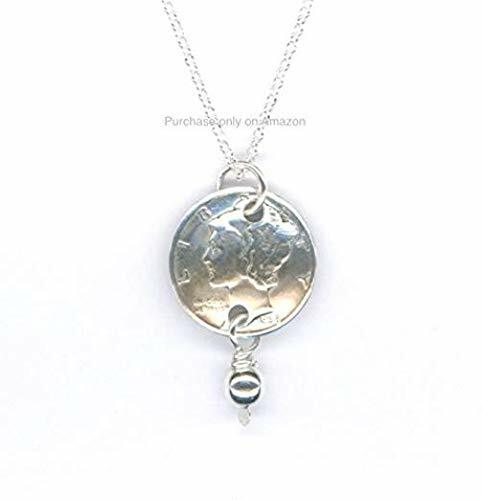 Available in your choice of gold, sterling silver, or mixed metals. Add her birthstone or a pearl for extra sparkle. 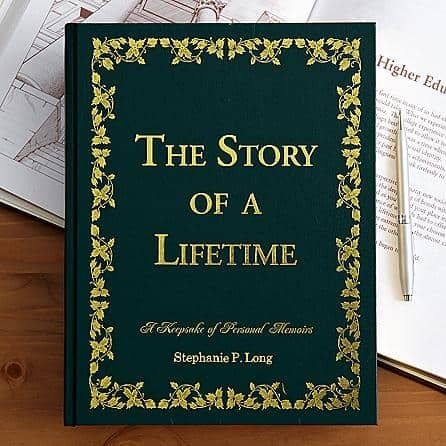 Help Mom preserve a lifetime’s worth of memories with this beautiful memoir book! Personalized book poses around 500 questions that range from easy to thought-provoking to help the recipient gather their recollections. There’s plenty of room to write answers on the gold-tipped pages. Mom will love strolling down memory’s lane, and you’ll love having the memories preserved for future generations. Perfect for the stylish mom who enjoys displaying her love for her family! 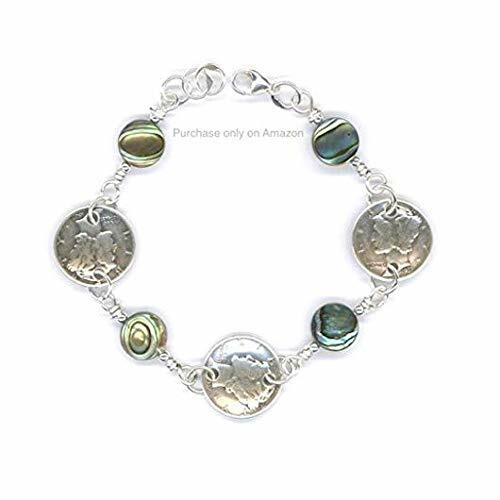 Sterling silver bracelet features up to 6 children’s names and birthstones, and is accented by 2 additional charms – a “Love” charm and an open heart charm. It’s bound to become your mother’s favorite piece of jewelry! Gift baskets always make delightful presents – it’s like finding a treasure chest of goodies on your front doorstep! My top choice for birthday gift baskets is GiftTree. They offer an almost-overwhelming selection of top-notch gift baskets. They have everything from luxurious wine and champagne gift baskets to themed gift baskets to inexpensive cookie buckets (under $30). You can add a personalized ribbon to many of their gifts – a wonderful way to customize a basket and add your own loving birthday message! 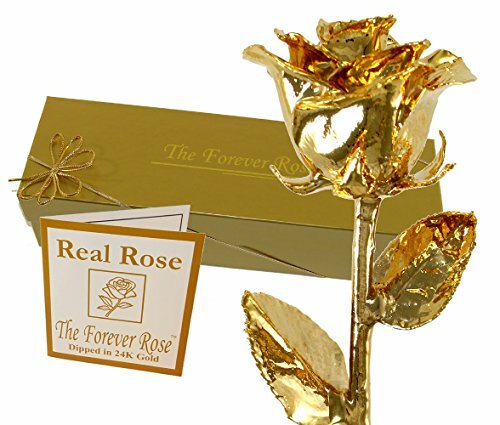 Mom can enjoy flowers - and your loving thoughts - all year long with this gorgeous floral keepsake. Add your own loving message to let Mom know how much you treasure her. 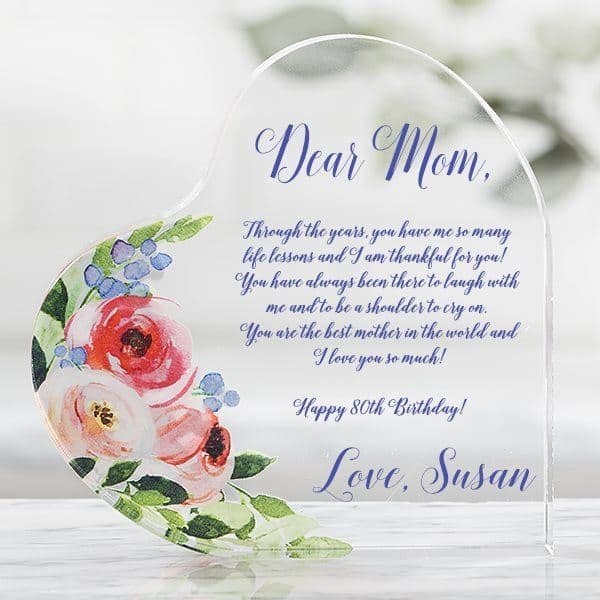 It's engraved in elegant script on the acrylic heart-shaped keepsake. Need a last minute gift? This can ship tomorrow! This special day is the perfect time for you to tell Mom how much you love and appreciate her – and this gorgeous personalized bud vase is a beautiful way to tell her! 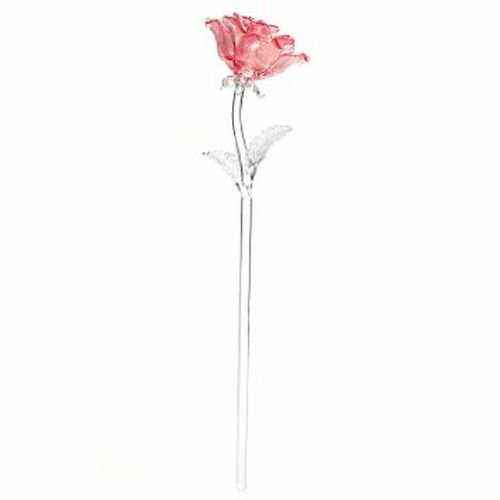 Exquisitely crafted crystal bud vase features your choice of 2 designs. 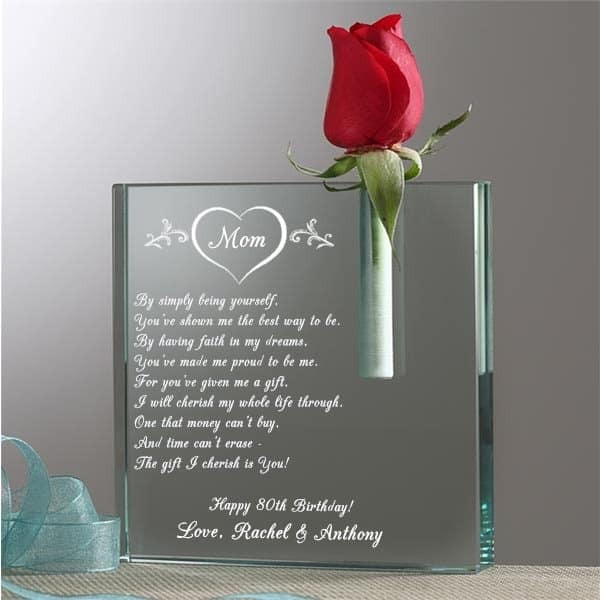 Choose from 3 pre-written verses, or write your own loving message to be engraved in the center of the vase. Customize at the top with any name or title, and add your own loving 2 line closing sentiment. If Faith is an important part of your Mom’s life, then this inspirational cross is a thoughtful way to mark her special occasion. 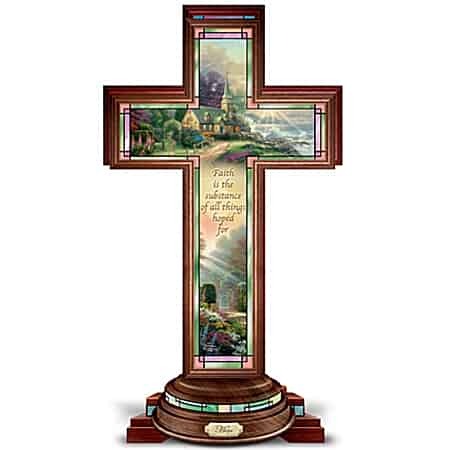 Heartwarming stained-glass style cross features Thomas Kinkade’s moving artwork, which is enhanced by the illumination built into the base. This striking music box is the perfect gift to celebrate your family’s loving ties, and to thank Mom for all that she’s done for you. 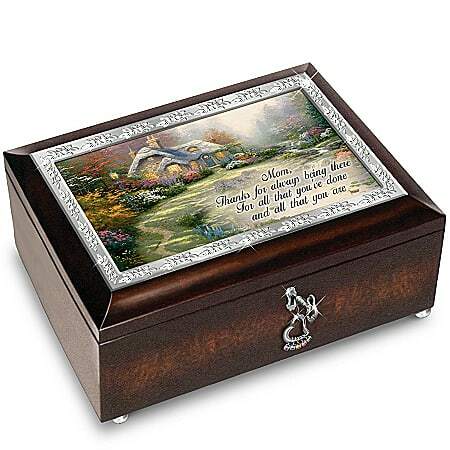 Handcrafted music box features Thomas Kinkade artwork on the glass lid. Heart charm on the lock features up to 8 children’s birthstones. “Mom, Thanks for always being there, For all that you’ve done and all that you are“. 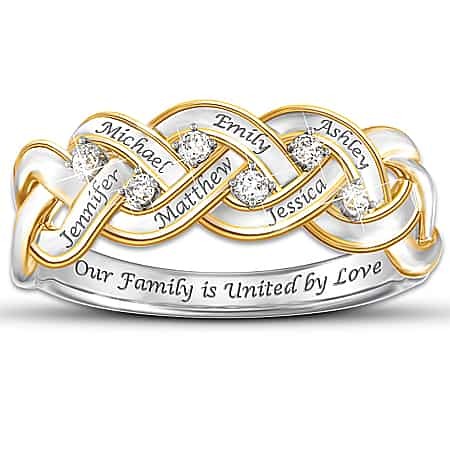 Your family shares a unique bond of love, and this striking diamond ring is the perfect way to let your mother know how much you value that love. Solid sterling silver ring is accented with 6 genuine diamonds and sparkles with 18k gold accents. “Our Family is United by Love“. 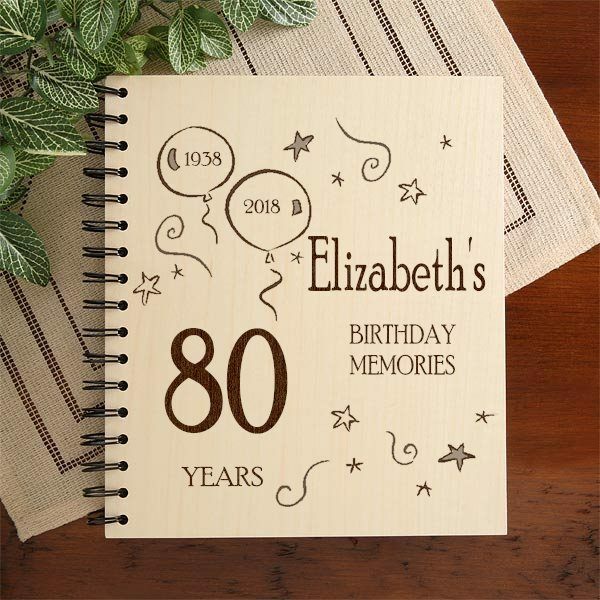 I’m sure you’ll take loads of pictures of Mom’s big day – and this unique personalized 80th birthday photo album is the perfect place to store them away for safekeeping! The sturdy natural maple album is available in 2 cute designs, and can be personalized with your Mom’s name and birthday. It holds 72 4″ x 6″ photos, so there’s plenty of room to preserve all the excitement and fun from the celebration! I’m sure there will be loads of pictures taken to commemorate this fun occasion – and this personalized picture frame is the perfect gift to showcase a treasured photo of the gathering! Available in your choice of 6 color schemes, the frame can be personalized with up to 3 lines. The perfect way to remember what’s sure to be a very special day! 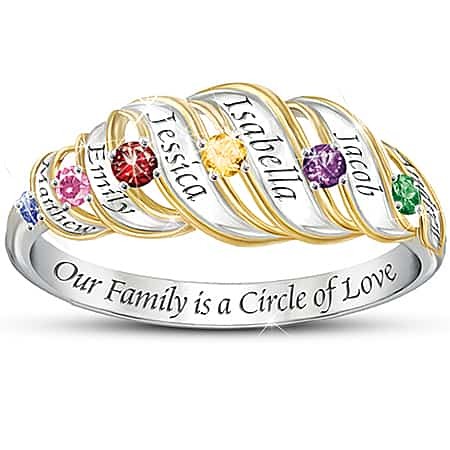 Sterling silver ring features 24k gold accents, and showcases up to 6 engraved names and corresponding birthstones. “Our Family is a Circle of Love”. 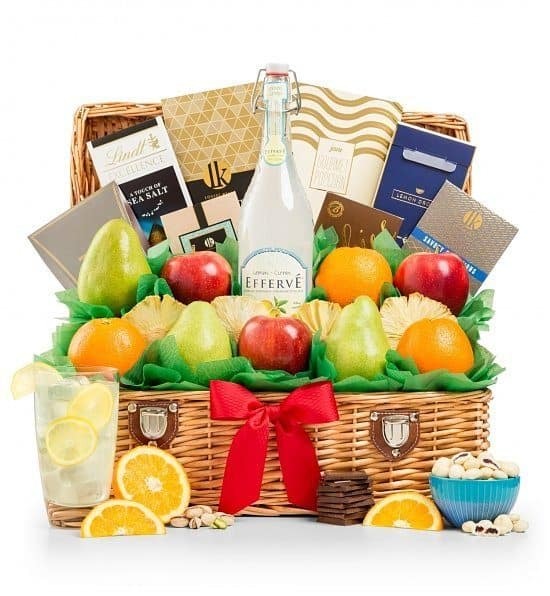 An 80th birthday calls for champagne, and this exquisite gift basket is a luxurious way to celebrate! 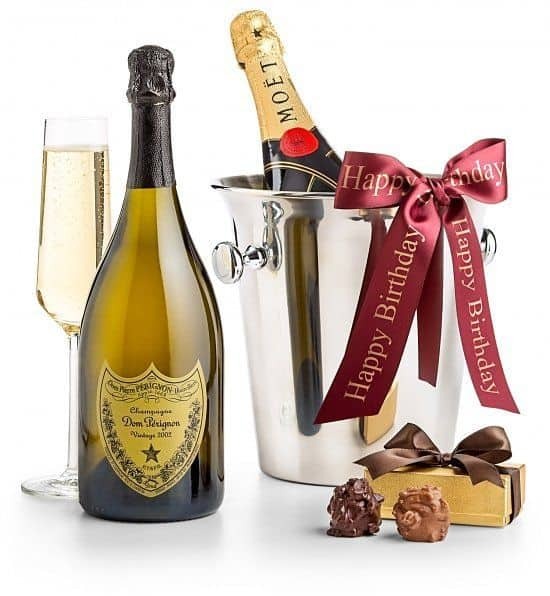 Presented in a champagne chiller, the gift includes chocolates and your choice of 4 bottles of elegant champagne. 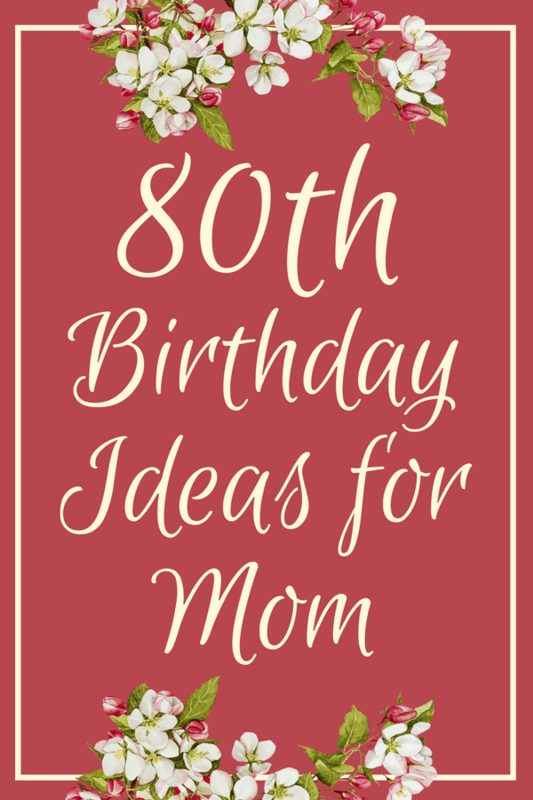 Add a personalized ribbon with a unique Happy 80th Birthday greeting for your mom. 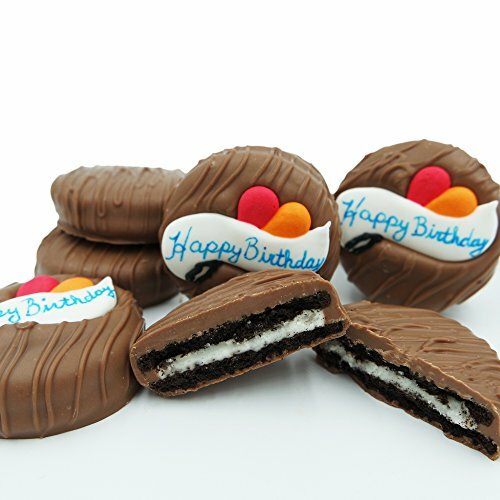 A decadent way to mark this milestone birthday! 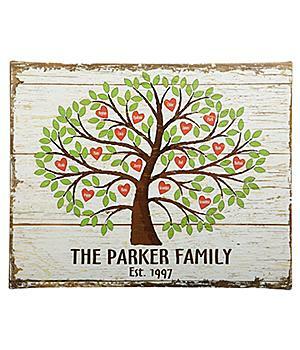 Mom can be surrounded by family – even those who live far away – when you give her this unique personalized family tree canvas! Available in 3 sizes, the adorable canvas features up to 24 family member’s names, each on their own bright red heart leaf. Add your own message or family name at the bottom, as well as the year the family was established. This colorful mug is a unique and affordable (under $20) gift that’s a fun way to honor a milestone birthday! Add Mom’s name and birthdate to the top of the mug. 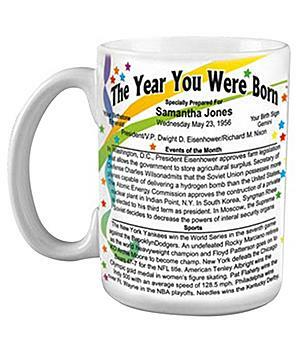 The mug features the top news stories, including sports and entertainment news, from the year she was born. It also features a price comparison of what common items cost then versus today. A great stand-alone gift, or you can pair it with coffee, tea, and a few small snacks to create a mini gift-basket. A bottle of wine is always a welcome gift – but for a milestone birthday like the 80th, go for something a bit out of the ordinary. 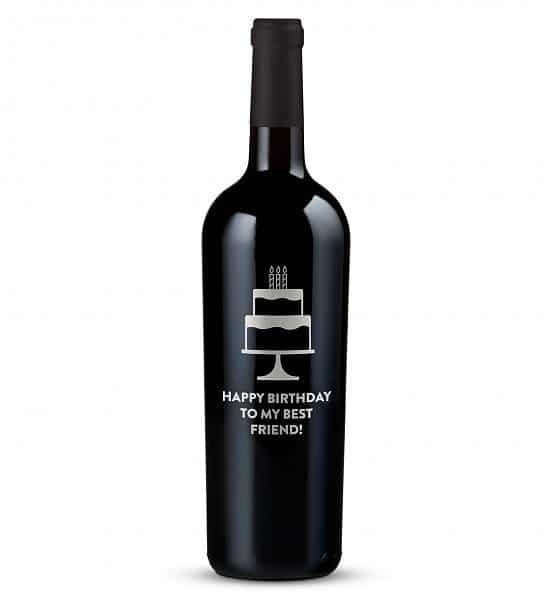 This personalized bottle of wine is a unique gift that’s sure to impress! Choose from 5 different designs, and then add your own 3 line message to create a one-of-a-kind gift. Mom will enjoy the rich California merlot, and then she’ll enjoy displaying the wine bottle (with flowers, perhaps?) on her mantle or table afterwards. Each family has its own traditions and memories, and Mom is at the heart of those traditions and memories. Share your family’s favorite things with this gorgeous personalized canvas print. 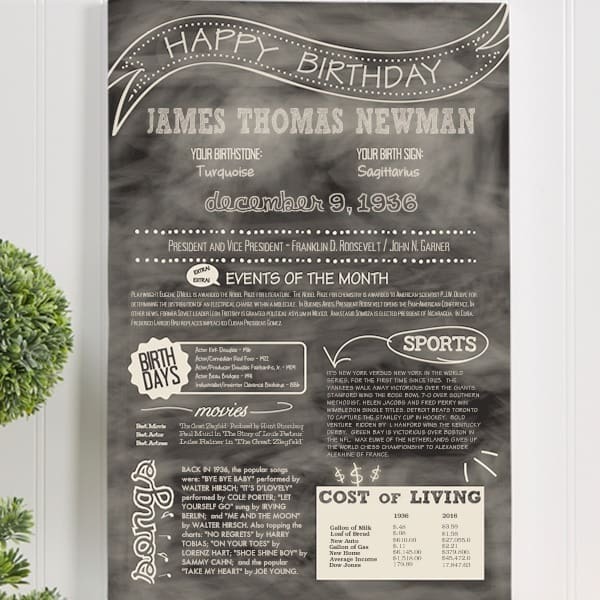 Available in 3 sizes, you customize the museum-grade canvas with your family name and 14 lines of personalization. You’ll have the option to preview your canvas before you order, so you can be sure that it’s just the way you want.